Black Friday- Stampede for Purchased Products – Imagine what will happen when things are FREE: IS this who we have become? Greg, John, and Pat discuss the mayhem that took place around the country on a shopping holiday called “Black Friday”. They continue to discuss that although the holiday is called Black Friday because it signifies a period in time when many retailers actually make a profit in the year they believe that black Friday is black and dark for a different reason. They continue to discuss how as they aired 3 minutes of a six minute video of continuous mayhem involving American citizens stampeding through stores. They ran over people, fought each other, and tore open packages and even vandalized property all to receive 25 to 50 percent off of merchandise they were going to buy. They further discuss how if this is what Americans are doing when they are willing to pay imagine when things are promised to them as free or they feel justified in taking something that doesn’t belong to them. They continue to discuss their concern based upon what the Lord has shown them. What will people do when the economy collapses and there is nothing left in stores. Will they head to your house? God will prevent this if we turn our hearts back to Him. Are Obama Care Ads Promoting Sexual Hookups? Greg, John, and Pat discuss how Obamacare Ads are promoting sexual promiscuity. Allegedly the national marketing campaign for Obamacare also known as the affordable care act is costing $700 million. According CBN NEWS “The campaign’s main targets are the working poor and young people.” While AARP is encouraging parents to “nudge” their kids about health insurance by sending e-cards to them, an ad for Colorado’s insurance exchange is pitching birth control coverage for random sexual encounters with the tag line, “Let’s get physical,” this ad shows a young woman boasting about how “easy” it is to get birth control with Obamacare all she has to worry about is getting a guy “between the covers.” Are we on the road to socialized healthcare or more importantly is America under God’s judgment? We are being turned over when it has comes to promoting giving away free birth control so that the only thing a young woman needs to be “worried about is getting a guy between the covers.” If this was not bad enough there are other ads depicting young people in other riskier behaviors. Is this what we think of our young people? This is a very sobering time in our nation’s history the question is will the church in America wake up? They continue to discuss how Obamacare is buying into promiscuity. What’s next a promise to kill any unwanted babies and to euthanize bothersome parents? We were able to see on “black Friday” what people were willing to do when they stampeded through stores causing mayhem just to save 25% off of things they were buying. Imagine what they will do if the promise of free healthcare is not delivered. It’s time to turn our hearts back to God. John, Greg, and Pat discuss how Forbes Magazine names Tim Tebow most influential NFL player for 2013. The interesting thing is that Tim Tebow has not played a single play in the 2013 season. They continued to discuss that all Tim Tebow did was live his life dedicated to the Lord before all. He loves Jesus and was not scared to share it even when it cost him personal ridicule. At the same time they continue to discuss that Tim just didn’t arrive in the NFL and said here I am. Tim Tebow works very hard to condition himself and strengthen himself to play football on the highest of levels. He is committed to working with integrity and excellence. They discuss the possibilities of a church that possessed the same work ethic and integrity. Tim being recognized as Forbes most influential play is not as important as heavens recognition of his influence. They encourage us to do the same no matter where you are in life and no matter your position. Just play and work for Jesus. 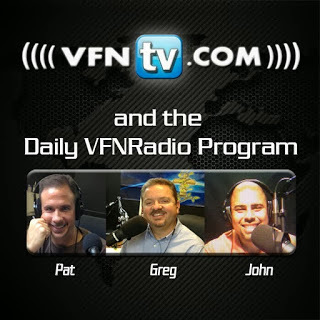 Greg, John, and Pat discuss the importance of standing firm in your faith. They further discuss what the Bible says in Isaiah 7:9 “If you do not stand firm in your faith, you will not stand at all.” So many people are standing today on America and the Constitution not realizing that America stands today because of the word of God. America is just the by product. They further discuss how the church for so long has intertwined the church and America into a knot when in fact, they are completely a stand apart. America and her flag is a by-product of men who stood with God. They continue to discuss how America is so shaky and encourage us to stand on God and His word, stand firm. So many today are double minded and get nothing from God. They encourage us to put on the full armor of God. The full armor of God helps you to stand against the plans and strategies of Satan. Many people today are terrified because they are spiritually naked. They encourage us to put on the full armor of God that enables us to stand when the day of evil comes. They continue to discuss the armor of God that we are instructed to put in God’s word in Ephesians 6:10-18. “Finally, be strong in the Lord and in his mighty power. Put on the full armor of God, so that you can take your stand against the devil’s schemes. For our struggle is not against flesh and blood, but against the rulers, against the authorities, against the powers of this dark world and against the spiritual forces of evil in the heavenly realms. Therefore put on the full armor of God, so that when the day of evil comes, you may be able to stand your ground, and after you have done everything, to stand. Stand firm then, with the belt of truth buckled around your waist, with the breastplate of righteousness in place, and with your feet fitted with the readiness that comes from the gospel of peace. In addition to all this, take up the shield of faith, with which you can extinguish all the flaming arrows of the evil one. Take the helmet of salvation and the sword of the Spirit, which is the word of God. And pray in the Spirit on all occasions with all kinds of prayers and requests. With this in mind, be alert and always keep on praying for all the Lord’s people.”They discuss how each piece of the armor is significant in our ability to stand firmly for God. God has called those who are committed to him to stand firm in Him letting nothing move you.